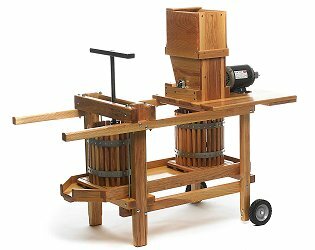 The Correll press is one of the best-made small cider presses in the world. Contact Phil Pieri for reservations. Reservations for weekends in-season need to be made very early, as it is used for numerous public events, but weekday reservations are usually easy to get. You can download a pdf set of instructions or view a a photo set of instructions at the Correll website. This year we added a set of buckets and tubs for ease of use. If you break or lose one, we bought them at Lowe’s in Cotati, where replacements can be obtained.